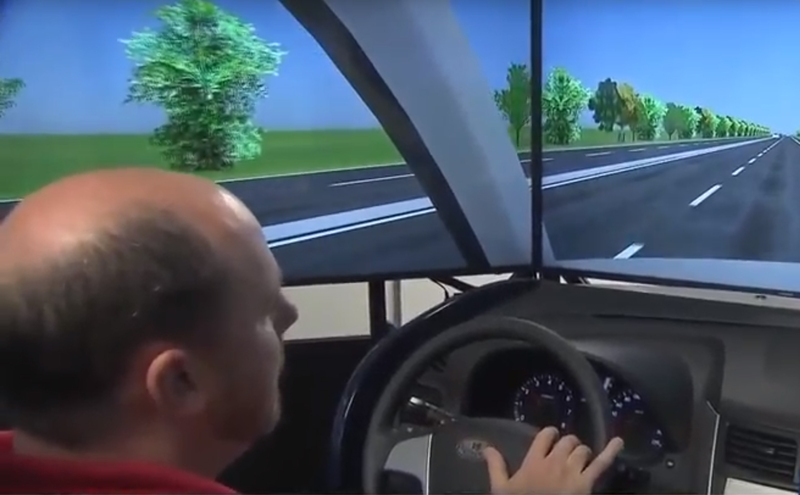 To make NC roads and highways safer for everyone, researchers at N.C. State’s Edward P. Fitts Department of Industrial and System Engineering (ISE Department) are using a first-of-its-kind driving simulator. The lifelike driving simulator is helping researchers with projects in various areas (described below). Distracted driving is a major problem in the nation. It ranges from what’s on the radio to making calls and texting while behind the wheel. And experts say it is only going to get worse. ISE Department’s Professor David Kaber and Jing Feng, an associate professor of Psychology Department, are working together to understand the human factors to promote safe driving and good interaction with upcoming technology and to make the best use of this technology. It is the first in the country to test a unique car simulator that features future technology distraction, something seen in only a handful of labs worldwide. The system gives a realistic feeling for how quickly a driver could get distracted by various prompts. The usage of the Eye Tracking Systems on the driving simulator during researches. As self-driving cars become more prominent, future drivers likely won’t pay as much attention to the road. Professor Kaber and Feng are studying how those attention changes will affect how drivers interact with road objects, particularly signage. Supported by a grant from the NC Department of Transportation, the researchers use the driving simulator to examine the best ways to deliver important signage information to future drivers. And it helps them navigate through the future when businesses could use digital advertisements that pop up on your GPS screens or other vehicle monitors, instead of on highway billboards. Using the state-of-the-art driving simulator, the researchers will test how subjects respond to different kinds of in-vehicle messages during manual and fully-automated driving. They ultimately hope to develop preliminary guidelines on how to deliver signage information considering new vehicle technology. ISE researchers using driving simulator to make roads safer. Another project aims to help older drivers understand what cognitive changes come with age and provide training or advice that is tailored to those individual needs. The end result could include training and rehabilitation methods for older drivers. That could mean pointing out typical driving situations that pose more risk to an individual experiencing cognitive decline, such as making left turns. The aim of the project is to investigate certain features of driver behavior when confronted by a Diverging Diamond Interchange (DDI). The use of DDI has become more prevalent throughout the United States over the past 3 to 5 years. However, there are no existing guidelines or standards for the design of this type of interchange currently. The driving simulator offers users a highly realistic driving experience on or off-road either left or right-hand driving. Its software is also offered with an optional pre-built driver training environment & a range of different scenarios and emergency events. With the help of the driving simulator, the research will identify, review, and evaluate the geometric design features and the associated safety and operational performance of in-service DDIs across the US. This information will then be utilized to develop recommendations for the AASHTO Technical Committee on Geometric Design for consideration as future geometric policy and guidelines. Chris Cunningham, the Director of the Highway Systems Group at the Institute for Transportation Research and Education at NC State explaining the simulation details. Because the research projects on the driving behavior are intricate and impact a variety of fields, the studies are often collaborative. 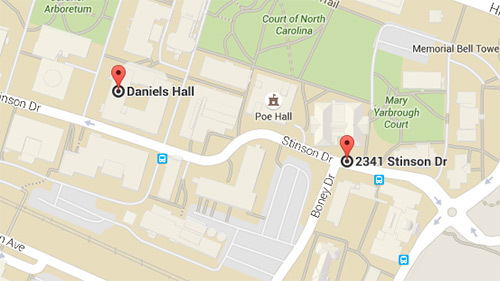 Currently, the ISE Department has partnered with many other departments and agencies. They include Department of Psychology, the Office of Research and Innovation, the NC Department of Transportation, the Institute for Transportation Research & Education, and others. Together, these agencies and researchers hope to prevent distracted driving by looking beyond what’s happening on North Carolina roads now and preparing for what could happen tomorrow. 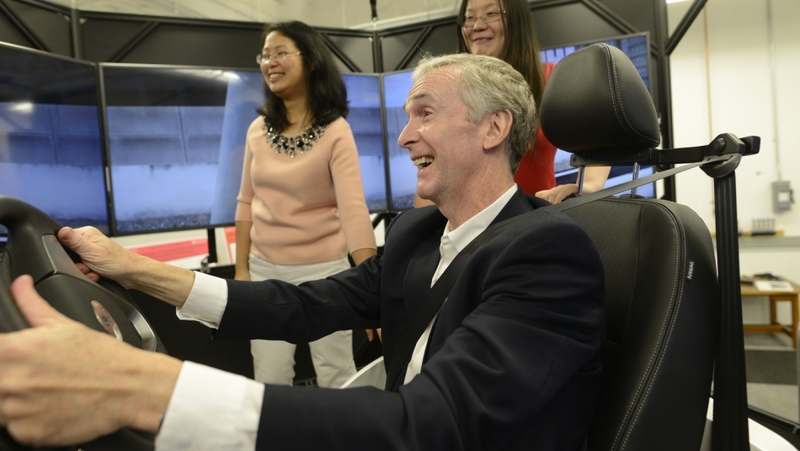 Humanities and Social Sciences Dean Jeff Braden takes a test drive in the driving simulator which replicates many elements of the authentic driving experience.